What are your backgrounds… how did you come to be involved with your Teen Café program? Emily: I have a BS in Biology and an MA in Museum Studies. 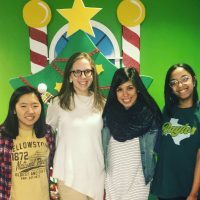 I was hired at the Mayborn to open our making and tinkering space, and during my first summer on staff I spent a lot of time with our amazing teen volunteers. When our director pitched the idea for a café, it felt like a great fit! I already had a relationship with teens who loved the museum, and I have a passion for science! 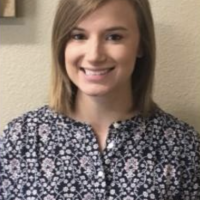 Sarah: After finishing the same graduate program as Emily in Museum Studies last May, I was hired on as a programming and teen librarian at the Hewitt Public Library in Hewitt, Texas. One of my objectives at the library is to provide STEM related programming for the teens in our area. After spending one summer with some of our regular teens, I learned that they show impressive leadership skills as well as are interested in science! I knew about Emily’s Teen Science Café program and asked if we could partner to reach the school district around the library. 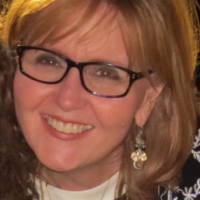 Sherry: After a highly rewarding and lengthy career in education, I came to the Mayborn to be part the education programming team. I am now completing my third year managing our volunteer program, which includes both adults and teens. Our director knew that we already had a terrific group of teens who were committed to volunteering at the Mayborn, and he approached Emily and me to begin the Central Texas Teen Café. Since the Mayborn is part of Baylor University, it really was a natural transition to incorporate teen volunteers, the Design Den (Mayborn’s tinkering space), and Baylor scientists to form a new café here. Central Texas Teen Science Café started at the Mayborn Museum during the 2016-2017 school year. This year, we decided to partner with another organization, Hewitt Public Library in Hewitt, TX. Hewitt is a neighboring town and their library is a community treasure. We thought that we may be able to expand our audience by having the cafés take place in two places around town instead of one. So far, the partnership has been a huge success! We are also lucky that the museum is part of Baylor University, which really makes it easier for us to find scientists and presenters. Both the Mayborn Museum and Hewitt Public Library are committed to providing engaging learning opportunities for our communities, and Central Texas Teen Science Café has been a great way to connect Baylor academics with the larger Central Texas community. Emily: Marketing and spreading the word! We have one teen who has worked hard to get the word out at her school, and that school has the highest attendance. We are finally starting to see a “regular” group come, but for a while, our numbers were really low. This year has been much better than the first year, and we think that is because we really have teen leaders who have bought into the idea of TSC. Sherry: Working around busy schedules of teens is challenging. We have a very strong leadership team of teens who are each involved in many extra-curricular activities. We gave teens some flexibility in selecting responsibilities for each café, knowing that they could not attend each time we met. Emily, Sarah, and I have been so pleased to watch them take the lead and function as a team. You know it’s a success, when the adults sit back and watch the teens lead the cafés. A presenter from Boeing came to share about her work with virtual reality and NASA. 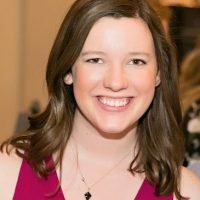 Emily: My favorite café was our most recent café, The Neuroscience of Sleep with Baylor researcher, Dr. Michael Scullin. Dr. Scullin talked to the teens about their sleep needs and how sleep affects our brains. The teens loved him! They were so engaged, asked very thoughtful questions, and they even wanted to take pictures with him after the café! I think that café showed me that there really is a formula to a great café. Engaging and prepared speaker + interesting and relevant subject + dedicated teen leaders (+ TONS of donuts) = a successful café. Sarah: My favorite café was our November café on virtual reality. Our guest speaker was Connie Miller, a web application and HoloLens developer from Boeing. Miller brought her virtual reality equipment for the teens to try on and test out. 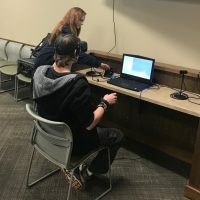 Miller works directly with NASA and the International Space Station, so the teens actually got to try a real virtual reality application that astronauts use. The teens were engaged with the activity, but also asked questions about how Miller reached her career at Boeing. Miller went to college at a time when computer science was not even a degree yet. She provided insight about being flexible in a career and taking advantage of job offers that will lead to new technology and opportunities in the field. I thought this was great insight for our teens, especially since the technology around us changes constantly. There are always new opportunities! Sherry: I so enjoyed the first café of this second year. 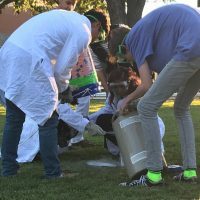 We have a longstanding relationship with a Baylor chemistry professor who said, “Let’s blow stuff up,” to get kids excited about science… and that’s what happened! The kids who came had a grand time with the liquid nitrogen experiments and meeting other teens from areas schools. They also had opportunities to ask questions of the professor and her students related to chemistry and college/career paths. 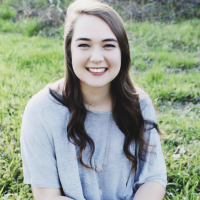 Emily: I love getting to know our teen leaders and watching them learn and grow in their roles. We have four teen leaders getting ready to leave us and we are so sad to see them go! Two of them are staying at Baylor, so we are hoping that they will come visit often. Sarah: I love that we are mobile. Since we have moved from the Mayborn Museum to the Hewitt Public Library, we reach both ends of a large populated area. For some teens, transportation may be an issue. I like that we can help them be involved with at least half of the cafés if they live close to either the Mayborn or the Hewitt Public Library. Sherry: What I enjoy most is watching the teens get excited about science. They come with a good bit of knowledge about our topics and they ask well thought out questions…they are eager to learn more. Emily: Take your time finding teen leaders. Seek out teens who enjoy science and are interested in what a café could offer their peers! My other advice would be to be patient. Give it some time. Your first few cafés may be small, but you have to give your café some time to gain traction! Sarah: Make sure your teen leaders know that they are in charge and let them know that you support them in any way. Having teen leaders who are interested in science, as well as have an understanding that the responsibility of the cafés ultimately fall upon their shoulders, adds to their confidence. With a combination of passion about science and the confidence to run a café, the teen leaders will connect the pieces for a successful café. Our teen leaders invest their time and their interests into our cafés, and our attendance and programs reflect that. Sherry: Starting new adventures is a process that takes time to evolve and settle. We were very intentional with the selection, training, the expectations we placed on our leadership team. 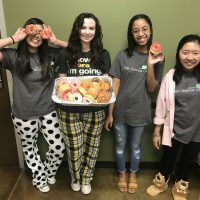 These teens stepped up to the plate and took ownership of the café, which in turn made our cafés more engaging and fun for the teens who attend. We evaluate after every café and make adjustments all along the way. I think adults and teens would agree that this is quite a rewarding endeavor. Teen Leaders at a teen leader Christmas party for the teen leaders.